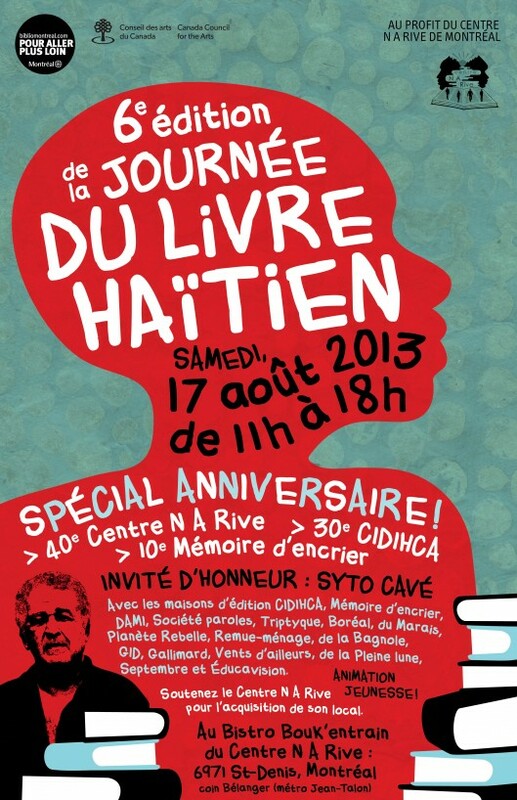 August 17: 6th Annual Haitian Book Day: Special Anniversary Event! The 6th Annual Haitian Book Day is celebrating 3-fold this year! Haitian playwright & poet Syto Cave will be the guest of honor of the 30th anniversary of CIDIHCA. In addition, the event will mark the 10th anniversary of Montreal-based publishing company, Memoire d’Encrier and 40th anniversary of the organizer of this event, le Centre N A Rive. This entry was posted on Tuesday, August 6th, 2013 at 1:21 pm	and is filed under Arts, Events, Literature, Poetry, Weekend. You can follow any responses to this entry through the RSS 2.0 feed. Both comments and pings are currently closed.